Detailed in this section is information on the blue road signs located on UK roads. 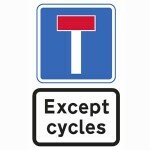 The theory test involves questions related to these road signs. 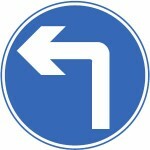 What are blue road signs used for? 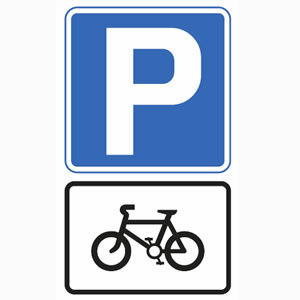 Blue road signs provide motorists, cyclists and pedestrians with a wide range of information, depending on their shape and location. 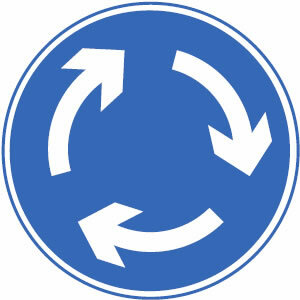 Circular blue signs provide positive instruction, for example by emphasizing particular lanes or routes available to road users or pedestrians. 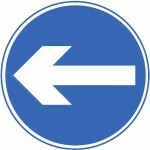 Blue circular signs also provide mandatory instruction, for example by informing a road user that they must turn left ahead. Blue rectangular road signs are used for informational purposes except on motorways where blue rectangular signs are used for directions. Once you have familiarised yourself with the many UK road signs and their meanings, take a look at our road sign test quiz and test your knowledge to see if you are ready for this part of the theory test. 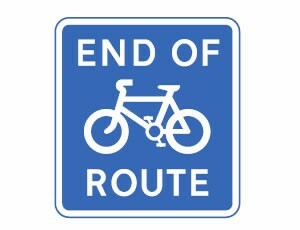 These regulatory blue signs inform road users of which mandatory route must be taken. 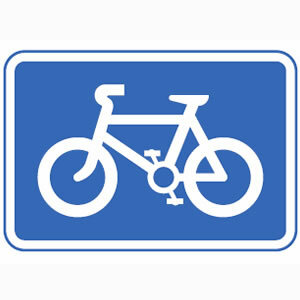 See mini roundabouts and one-way streets and systems for further information. The vast majority of roads in the UK do not have minimum speed limits enforced. 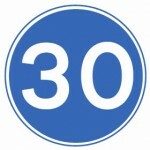 Those that do utilize a blue circular road sign that differs from circular signs with a red ring signifying the maximum speed limit. Minimum speed limits are imposed to maintain a steady continuous flow of traffic. 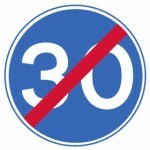 See minimum speed limits and driving too slow for further information. 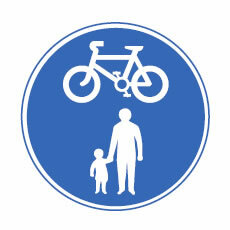 Traffic calming measures are seen more frequently on UK roads. 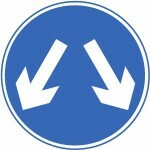 Road narrowing on one, or both sides is a technique often employed to slow traffic in residential areas. 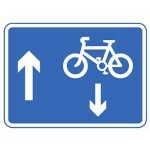 Priority through the narrowing is often controlled by signs and road markings. The circular sign is informing drivers they must give way to oncoming traffic and the blue sign is informing drivers that they have priority. 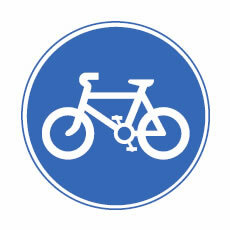 Road signs for cyclists and cycle lanes are mostly blue, although blue signs may be accompanied with a directional white road sign. 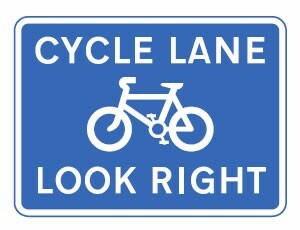 The driving theory test involves answering questions on many road signs including signs for cyclists and cycle lanes. 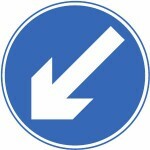 pick up or set down passengers. 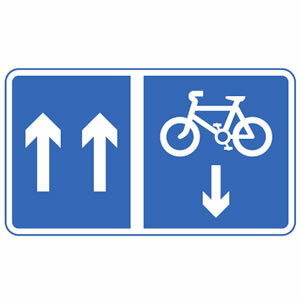 Contra-flow pedal cycles in a one-way street. See contraflow bus and cycle lanes for further details on how a contraflow system works. 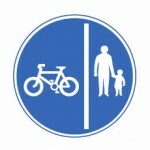 Mandatory with flow of traffic pedal cycle lane ahead. 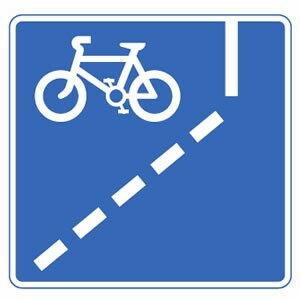 With the flow of traffic bus and cycle lane. Contra-flow (against the flow of traffic) bus lane sign. 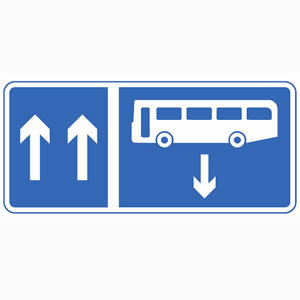 Bus lanes signs are blue and are accompanied with road markings. The times that bus lanes are in operation may or may not be show on the sign. 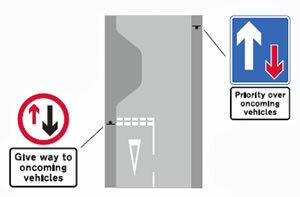 It is illegal to drive in a bus lane within its operational times. 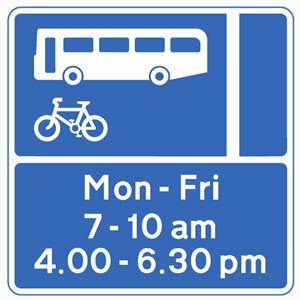 If no times are visible, assume the bus lane is in operation 24 hour a day. Bus lanes can usually be used by buses, taxis and cyclists in times of operation. 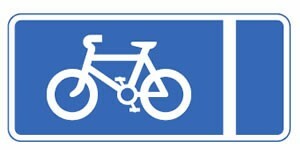 For further information, see bus lane signs and bus stops, plus bus lane road markings. 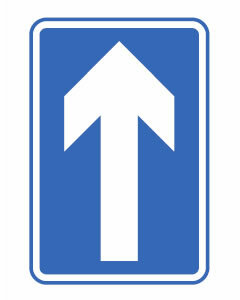 Most motorway signs are blue and although currently learner drivers cannot legally drive on motorways, the law may change to allow the use of motorways to learner drivers. 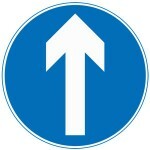 Motorway signs and signals are however used as part of the multiple choice question categories within the driving theory test. See motorways for an in depth guide on motorway rules, reflective studs, signs, signals and rules.